Auggy and Raphy learned line-art from children program in MoMa (Museum of Modern Art). This program enlightened me and I aware that Chinese characters are very much like line-art, which composes of different shapes of lines. Some present 27 strokes and others bring up more or less. 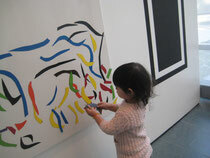 Children love to see something moving, which will cause their interest to study Chinese strokes. The animated strokes provided here base on the concept of line-art, which is painless for children to learn, but they are some different from Chinese calligraphy.